Some days are all about coffee. The 13th Colony’s motto, “We found Earth, now where can we find coffee? !” was originally born out of 1) my personal addiction, and 2) my quandry as an organizer about what a good location would be for our group to meet for the first time. This is Vancouver after all, so coffee places are the most likely venues just for the sheer number and variety of them. Our first meet-up was at a Tim Horton’s location. A very popular chain in Canada, not surprising considering its hockey connection. Plus, they have timbits! Very quickly, however, it became apparent that I needed to find, not just good coffee, but a shop with enough space to fit all of us. Twenty people showed up that first day. We had to re-locate. We’ve tried another chain since, and had a couple events at a local diner. But our quest for the perfect coffee shop we can call “home” continues. Perhaps I should ask the Cylons what they prefer? Recently, a generous friend gave me a copy of the original Battlestar Galactica movie, starring Lorne Greene. I had a chance to unwind last night and popped it into the VCR. Having been so absorbed in the new series lately, it was interesting to take a look back to where it all began. Just as Star Wars delved into mythology to achieve a more satisfying journey for its hero, the original BSG was steeped in ancient history to give it a sense of dramatic scope. Of course, Greene himself added a great deal of the gravitas just through his performance, but the references to gods and heroes of history and myth were deliberate. The Council of the Twelve wore robes that looked like Roman togas. Apollo, Athena and Cassiopeia had names from Greek mythology. The Colonies were named for the signs of the zodiac. The viper pilot’s helmets echoed the sarcophagi of ancient Egypt. Yet clearly the show was trying to be as modern as it could be. Centons, microns and cubits gave a futuristic sense to it all. Rather than an occupation, you had a designation and those could include a socialator or a travelator. The atmosphere of the casino on Carillon captured the excess of the real Studio 54, right down to the disco music. I had forgotten how much humour there was. When Colonel Tigh gets caught going through lockers to grab extra uniforms, his reaction is wonderful. Obviously, some bits don’t age well. The characterization of Athena doesn’t improve over time and I’m not surprised there wasn’t a place for her in the new version. She had no purpose except to react to events and balance a love triangle. Muffitt II is still a chimp in a suit, but no worse a cuteness infraction than the Ewoks from ROTJ. 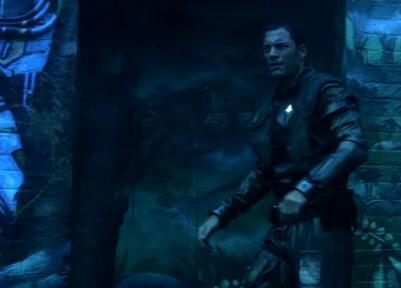 The repeat of special effects shots within a two hour movie seems an unforgiveable lapse. 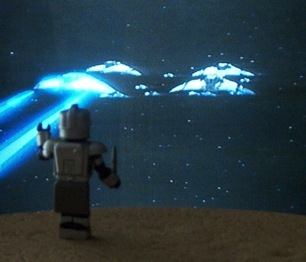 The shot of a computer screen showing the advancing Cylon fleet at Carillon, still showing the two viper icons fleeing ahead from the opening sequence, seems more an error than a cost-saving. I had a huge crush on Starbuck when I first saw the show. Now I’m glad they made the character a woman. He’s a relic of the 70s and I can’t see how a modern character with his attitudes could be made either charming or likeable. Despite all its flaws, I was hooked. I wanted to follow the rag-tag fleet on its quest for Earth. And nearly thirty years later, I’m still watching eagerly. One of the coolest things about being in Vancouver has got to be that we are “Hollywood North.” In general, Vancouverites are pretty cool about it. We see film sets every day, we occasionally spot movie stars in our midst and yet rarely do we bother them. Canadians are notoriously polite. We would not dream of imposing ourselves on anyone. But that doesn’t mean we can’t totally geek out when the stars aren’t around! The 13th Colony recently undertook the first of several “Caprica Scouting” missions planned for this summer. Seeing as Vancouver is where Battlestar Galactica is shot, Vancouver serves as Caprica, New Caprica, Kobol and other locations within the fleet. We started with Season One, checking out a number of locations in downtown that were featured in the first season episode “Litmus.” A bunch of us studied a collection of screen shots from Season One and tried to identify where the episodes were shot. A dozen of us started the day at Vancouver’s Central Library, which is where the banner photograph for this blog was taken. The Library was an easy place to start since it is a popular landmark in our city. Those two Cylons are actually “mini-mate” toys, readily available at your local comic book store. Another easy to spot location was the roof of the old Woodwards building. The giant W sign in the background marks the spot where No. 6 beats the frak out of Sharon just to make it look convincing. Woodwards is gone now, a hole in the ground currently being rebuilt into trendy condos. We had also narrowed down a restaurant called The Alibi Room as the place where Helo and Sharon hide out from the Cylons. The storefront was digitally altered, but still recognizable. But clearly our triumph of the day was finding what I call “Helo’s Fire Escape.” Vancouver’s downtown east side is filled with alleys that are covered in vibrant and colourful graffiti. With a little help, we found a promising location and headed off. Now if you don’t know Vancouver, you might not know that the east side of our downtown is decidedly rough. It’s been in the news recently for its drug problems and the trial of a particularly notorious serial killer. It is an area most people stay away from if they can. Needless to say, the members of the 13th Colony had to be convinced to enter this particular alley to check it out, even during the day and even in the company of eleven other geeks and two cylon toys. But I was on a mission to find the place, and I think the result was worth it. Here’s a picture we took. 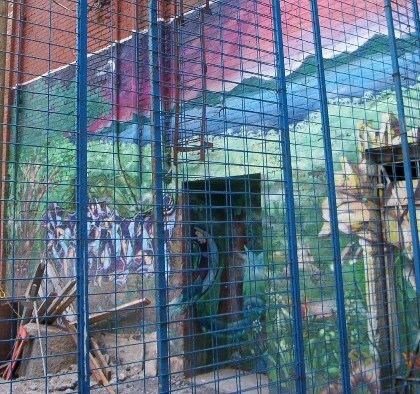 The building is behind a fence since it is the last building that remains in that alley, before the great hole the will soon be the Woodwards condos begins. The graffiti is beautiful. But the coolest thing is knowing that the cast and crew of our favourite show lingered at this spot and used it to create a scene which transports us to a different world. A world without the broken glass and discarded needles of a downtown alley. Granted, Caprica has its own problems. Nuclear proliferation and Cylon invasion are no picnic, I’m sure. But it’s fiction. And we love it. Our group is planning more Caprica Location Scouting missions during the summer. The campus of the University of British Columbia in Vancouver served as several locations aboard Cloud Nine. And Simon Fraser University in Burnaby has been featured as locations on Caprica and Kobol. The interior of the Orpheum Theatre on Granville Street is where D’Eanna got her first glimpse of the “Final Five”, and has been featured in the dreams of Gaius Baltar and Laura Roslin. It is a beautiful theatre in it’s own right and this year marks its 80th anniversary, so we’re signing up for a tour. A few months ago, when our club first started, we chose as our motto, “We found Earth, but where can we find coffee? !” Now I’m thinking a better motto might be, “We’re here, and you’re not.” Not to rub it in…too much. You are currently browsing the The 13th Colony blog archives for June, 2007.